The Washington Nationals have had a rough first week of the season. They’ve started the year 1-3, including Tuesday’s loss at the hands of former star Bryce Harper and the Phillies. 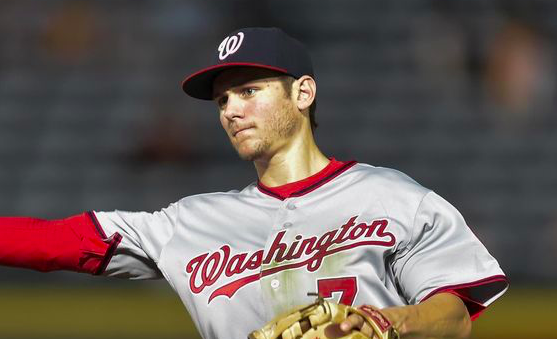 To add insult to injury, the Nationals also lost shortstop Trea Turner to injury on Tuesday. Turner was hit in the hand by a pitch in the 1st inning of Tuesday’s game. He left the game and has been diagnosed with a non-displaced fracture of his right index finger. At the moment, Washington has not given a timeline for Turner’s return. However, he’ll likely miss a significant chunk of the season. The Nationals will place Turner on the Injured List on Wednesday and bring up another infielder. However, the club has no plans to promote Carter Kieboom, who is one of the top shortstop prospects in baseball. Kieboom finished last season in double-A, so the Nats would be rushing him to the majors if they asked him to fill in for Turner. Utility infielder Adrian Sanchez is the most likely call up for Turner’s spot on the roster. The Nationals are also awaiting the return of veteran Howie Kendrick from a hamstring injury. However, Kendrick may be a few days away from coming off the IL. Either way, Wilmer Difo is set to be the team’s primary shortstop for the time being. Difo has been a useful backup infielder during his career. His offensive productivity can be lacking at times, but he’s sound defensively. Naturally, there will be a considerable drop-off from Turner to Difo. Turner has been one of Washington’s best players early in the season, going 5 for 14 with three extra-base hits early in the year. His two home runs against the Mets Sunday helped the Nats to their first (and only) win of the season. He’s been an ideal no. 2 hitter in the lineup behind leadoff man Adam Eaton. Finding a replacement for that spot in the order will be difficult. Turner has also stolen four bases the first week of the season, and his speed will be tough to replace as well. Needless to say, things have gone from bad to worse for the Nationals with the injury to Turner. They find themselves in a division in which they are one of four teams making a serious effort to compete for a playoff spot. If their slow start continues, it’ll be tough to catch up to all three teams in the standings. With Turner likely unavailable for several weeks, getting through the early part of the season in good shape figures to be a formidable challenge for the Nationals.